Good Morning friends, Happy Hump day. Hope your day is off to a great start. I am sharing a card today featuring Kraftin Kimmie Buddy Bears. I just received this stamp in the mail and its super adorable in person. One of the challenges that was apart of the Krafty Krop this weekend was to create a project using one a animal and twine. I am slowly working through all of the challenges. This stamp set was perfect to create a card. I inked the stamp up using momento tuxedo black ink on copic x-press it blend card stock. I then colored the image using my copics. 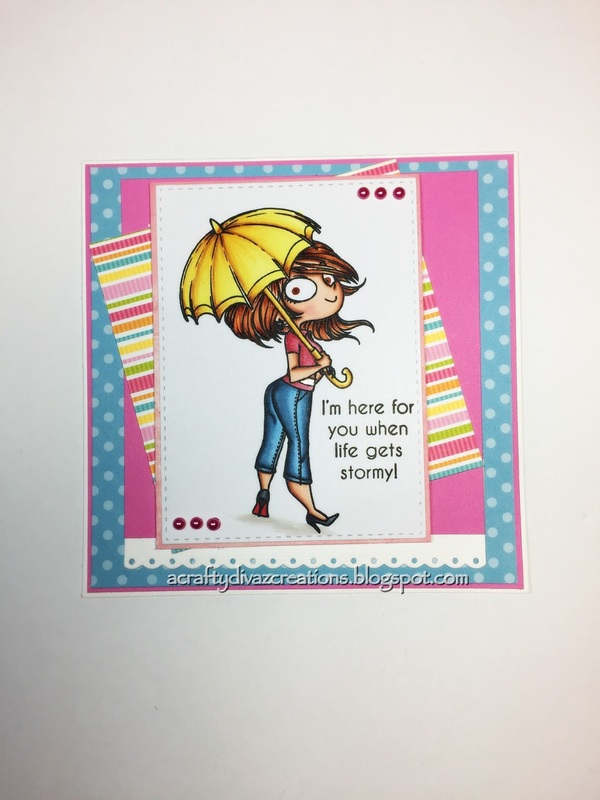 I die cut the image out using a circle die from lawn fawn. I layered the stitched and scalloped die cut behind the image. The papers I used are from Echo Park dots and stripes. I love this color combination, just brings out this little bear. I then added the sentiment to the card which is from the squishy hugs stamp set. I added some twine to the panels and to finish the card I added some enamel dots. I love the way this card turned out, its going in the mail tomorrow to a special friend. That's all I have for now, thanks for stopping by. Have a awesome Hump Day!!! Good Morning friends, yep its Monday. Hopefully your Monday is off to a great start. It took me a while to get out of bed this morning. I kept thinking, I just need one more day. I am pretty sure I am not the only one who thinks that when Monday rolls around, lol. 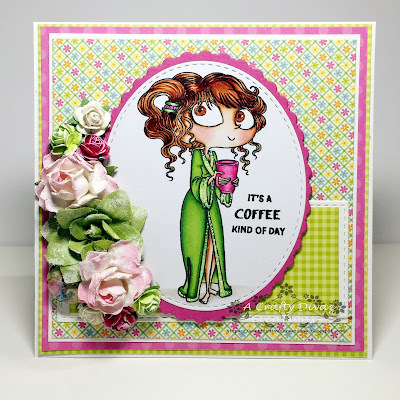 Today I have a card share for today using a Kraftin Kimmie Stamp called Angie. As you will see, she is holding a cup of coffee and anything coffee related I am all over it. I decided to participate in this weekend's Kraftin Kimmie Spring krop online over on Facebook. 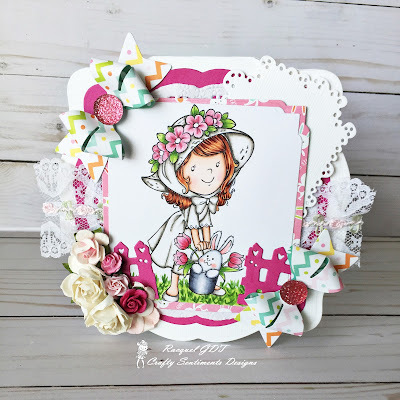 The first challenge was to create a spring project using one of the Kraftin Kimmie stamps and add flowers. Well, I decided to ink up Angie and color her up with my copics. I used a stitched oval die from CC Designs to cut out the image and layered the fancy scalloped oval die cut by Kat Scappiness behind it. I used Hello Sunshine paper collection by Doodle bug which I picked up from a local craft store. 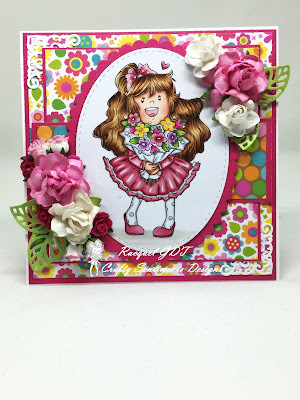 I added some wild orchid crafts flowers to the card and I love the way this card turned out. That't all I have for you today, thanks for stopping by. I hope this card provides some inspiration to get crafty. Have a awesome Monday! Good Morning crafty peeps, thanks for stopping by today. Hope your Saturday is going well and you are getting some crafty time in. 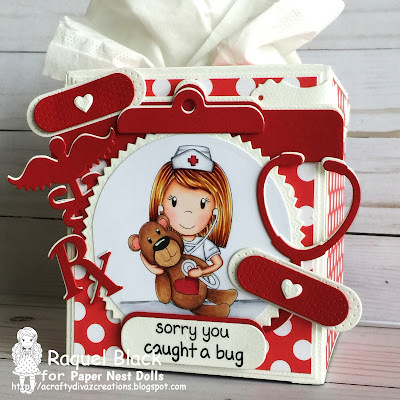 Today I am sharing a cute project using Nurse Emma and Teddy by The Papernest Dolls. Oooohhhh she is sooo adorable and that teddy bear OMG. You can pick up this cutie now in the store here. I decided to create a tissue box holder for this project. I printed the image out on copic x-press it blend card stock. I colored nurse emma and teddy with my copics. 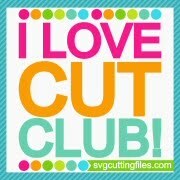 I then die cut the image out using a circle die and layered a zig zag circle die cut behind it. I used Echo Park summer dots and stripes designer papers with this project. I added various first aid die cuts to the front of the panel that I had in my stash. I also added a cute sentiment to the bottom. I love the way this project turned out, nurse emma with teddy was perfect! Definitely check out Nurse Emma and teddy in the store. Don't forget to share your Papernest Dolls projects with us over on the Papernest Dolls Inspiration Facebook page. That's all I have for you today, thanks for stopping by and have a Fabulous Day! Good Morning friends, Happy Friday!!!! The weekend is here, sort of just a couple of more hours of work and the weekend will be here. Today is the start of the coffee loving card makers spring blog hop. You can check out all the details here. For those who know me, know that I am a coffee fanatic and my favorite is starbucks. 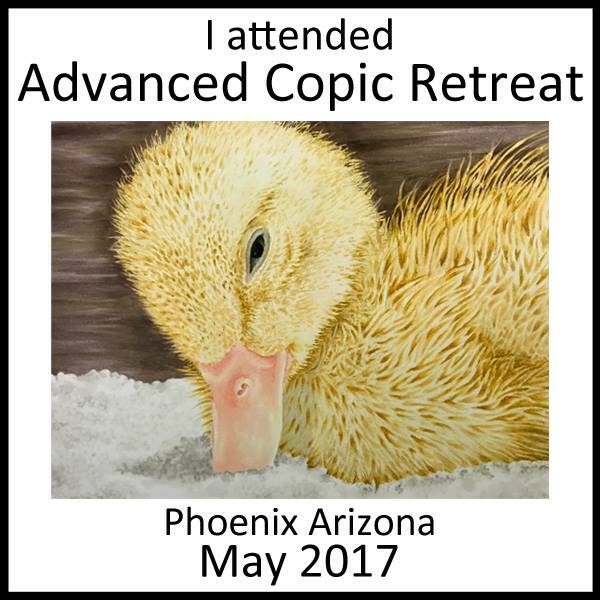 I decided to create a card and participate in the blog hop. I used Latte Lucy by CC Designs. I just love her, she is super adorable with her coffee in her hand. I stamped the image out on copic x-press it blend card stock and colored her using my copics. I cut her out using a lawn fawn circle die and layered her on a fancy scalloped circle die from kat scrappiness. I wanted to use the new doodle bug cream and sugar DSP to create this card. I cut out a stitched panel and layered the patterned paper over the stitched panel. I then used MFT stitched scallop basic edge for the bottom of the DSP. I added the sentiment at the bottom of the card from the simon says stamp set coffee and tea. I love the way this card turned out!!!! Thanks for stopping by today, hope you have a great Day!!!! 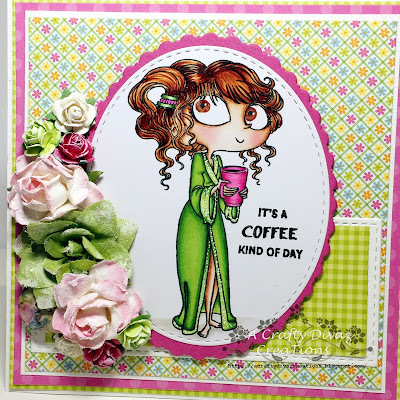 Check out the coffee loving card makers blog hop for all types of inspiration. Good Morning friends, time for another Inspirational Thrifty Thursday over on Scrapper's Delights blog. I am sharing a cute card using Ava unicorn pony which you can pick up in the store for a great price. I needed to make a birthday card for a special person and this image was perfect. I used a paper pad called enchanted that I picked up from my local craft store. I die cut some clouds using one of my dies from my stash and layered them on the card. Since this is a birthday card, I die cut the words happy birthday from a die I have in my stash and place them on the card. I then added some nuevo jewel drops on the card. You can barely see those in the photos but they are there, lol. I colored Ava with my copics and cut her out using my brother scan and cut. I love this card, its so magical and remind me of my childhood. Well that's all I have for today, thanks for stopping by and I hope you are inspired to get crafty. Check out the scrapper's delights store, there are some super specials going on right now. Also check out the faecbook fan page and join us. Show off your creations using any of the scrapper's delights images. Have a fabulous day and we will talk soon! Good Morning Crafty Friends, there is a new challenge that started today over at Crafty Sentiments Designs. It was fun to look at all of the creations from last week's challenge. 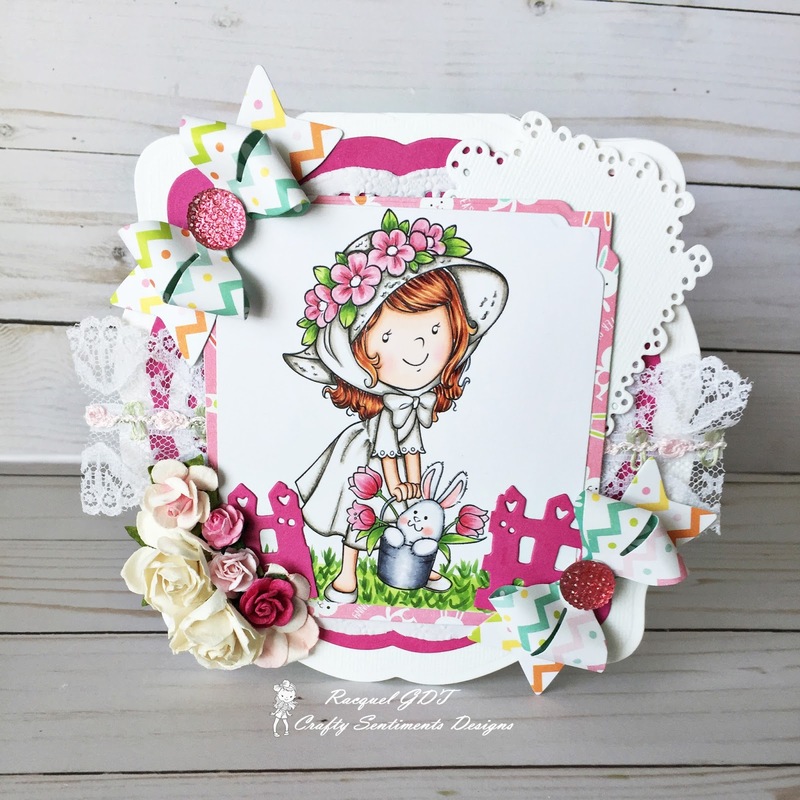 This week's challenge theme is Easter and I have a a cute Easter card to share with you today using Bunny in a Bucket. She is just adorable with her bunny in her bucket. I colored the stamped image using my copics and added the image to the card base. I added different die cut pieces to the card along with some lace and flowers I had in my stash. I love this card, its ready for Easter and making someone smile. Good Morning my friends, Happy Monday. If you were like me this morning you were probably wondering where did the weekend go. Yep, it just flew in and out and now we are back to the hustle and bustle of the week. Today is the first day of SPRING, hopefully for some more warmer weather. For me, its always warm here but I am glad Spring is here. 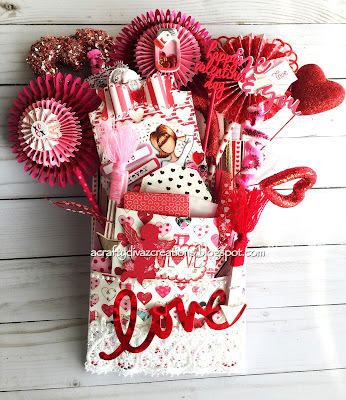 I have a card share for today using the CC Designs Little Pixie Valentine Cupcakes stamp set. I colored this cutie up a while ago and its been sitting on my desk for quite some time. I decided to make a card with her, since I needed to make a birthday card she was perfect. I stamped her out using memento tuxedo black ink on copic x-press it blend card stock. I colored her up using my copics. I used the Echo Park Party Time paper collection to create this card. I am loving this collection so much, so versatile for sure. I layered the scalloped oval die cut by Kat Scrappiness and the oval die cut from spellbinders behind the image. I also added ebony black nuevo crystal drops for added dimension. That's it for now, thanks for stopping by. I hope you enjoy the first day of spring and you enjoy some crafty time. Have a fabulous day!!!!! Good Morning crafty friends, its Saturday and time for some crafty time. 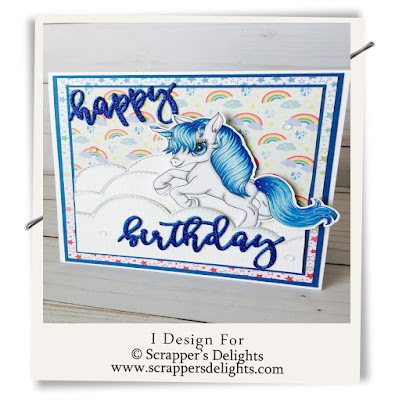 I want to share a card today using Kraftin Kimmie Look for Rainbows. This stamp set is so versatile and can be used for any occasion. I stamped the image out on copic x-press it blend card stock and colored the image using my copics. I cut the image out using Simon Says Stamp stitched rectangle. I used the Hello Sunshine DSP by Doodlebug to create the card. I added some enamel dots to the corners of the card to add some dimension. 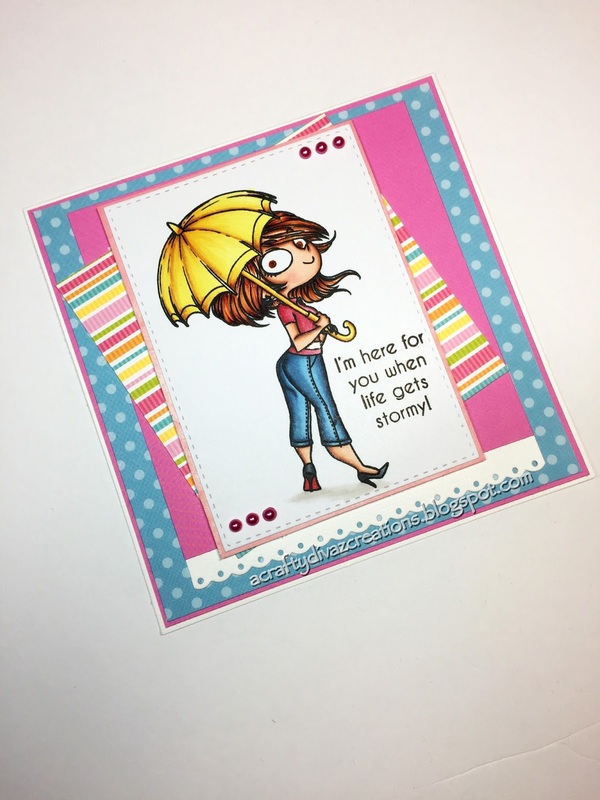 The sentiment is also from the Look for Rainbows stamp set. I then added the scalloped border from lawn fawn at the bottom of the card. 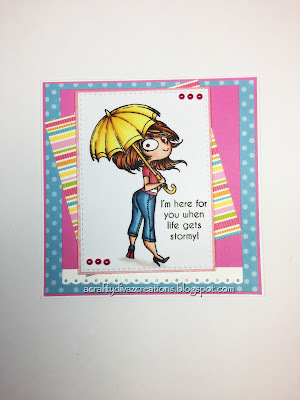 Check out Kraftin Kimmie store and the blog for cute stamps and inspiration. Thanks for stopping by and have a awesome Saturday. Good Morning friends, Happy hump day. We are at the midway point of the week and before you know it the weekend will be here. Ok so I have another good luck card for you today. I've pulled out all of my St. Patty's day stamps and decided to create some cards. 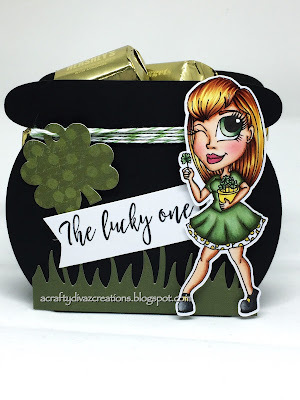 Today's share is using the cute leprechaun from CC Designs. He is just so adorable and would be perfect for good luck! I used distress inks to create the sky background. 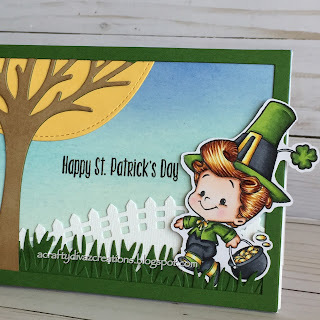 I used the lawn fawn leafy tree landscape die set to create the scene. I added the new lawn fawn little picket fence as well as the grassy border dies to the card. 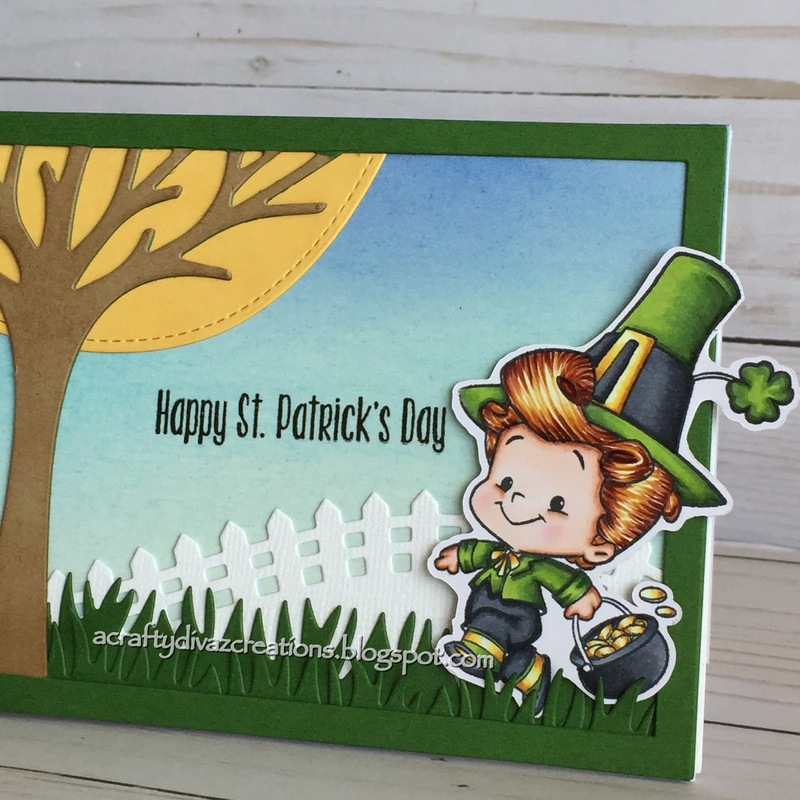 I stamped the leprechaun on copic x-press it blend card stock. I colored the stamped image using my copics and added the image to the card. This is definitely a good luck card for sure. That's all I have for you today, hope you enjoy this card. Thanks for stopping by and have a awesome day. Good Morning crafty friends, thanks for stopping by. 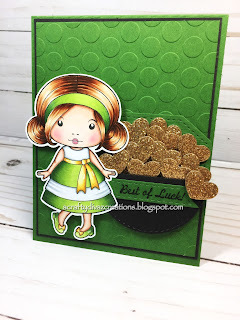 Today I am sharing a Good Luck card featuring the Lovely Marci by La La Land Crafts. I colored this image during La La Land's Facebook challenge a couple of weeks ago and decided to create a card with her. She is super cute and I love all of the green in her dress. I colored her up using my copics and cut her out using my brother scan and cut. I pulled out my large circle embossing folder and embossed the front panel of the card. I die cut a medium circle out of black card stock from the stitched circle die by La La Land Crafts. I cut the circle in half to create a pot to place my gold hearts in. La La Land Crafts is now carrying adhesive vinyl and foil in their store. Yayyy, I was super excited when Irina announced she was carrying this in the store. I had to add it to my cart immediately. This was the perfect opportunity to crack open my new adhesive vinyl. I used the gold vinyl on chipboard and die cut the hearts out using the stitched hearts set from La La Land Crafts. I layered the hearts in the circle to create dimension as I was going for the pot of gold affect. I added the stitched tag behind the hearts, I then added the sentiment Best of Luck from Irish Marci stamp set. Ok, I know I say this every time I create a card. I truly am in love with this card, I am loving everything about this card. This will be one of those cards that will be difficult to give away, lol. Well I hope you love this card as much as I do. Thanks for stopping by and spending some crafty time with me. Have a awesome Tuesday, we will chat soon. Hello crafty peeps, hope you are enjoying your Saturday. 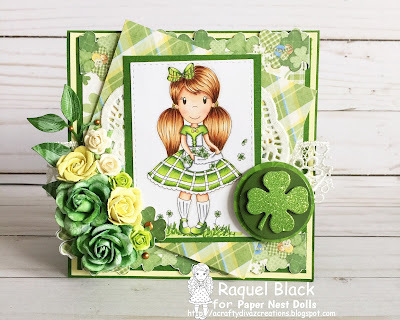 I am over on the paper nest blog today sharing a card I created using the digital image Ellie with Clovers. Isn't she just adorable? She was released recently and is now in the store for you to pick up. I printed the image out on copic x-press it blend card stock and colored her up using my copics. 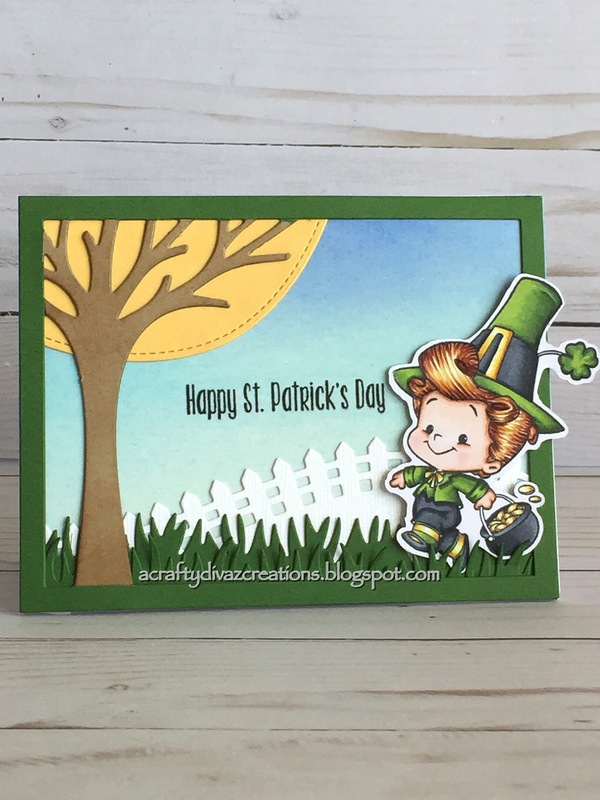 I used St. Patrick's day digital papers that I have in my stash to create this card. I added some green and yellow flowers to the card that were in my stash along with a green clover dimensional sticker. I also added some gold nuevo crysal drops for added dimension. That's all I have for you today, thanks for stopping by. I hope this card provides some inspiration to create those "Lucky" projects. Have a fabulous weekend! Hello my friends, it's Friday and I am super excited. I wanted to share a Valentine's Loaded Envelope I did for a swap I participated in on Facebook. My partner received her package this week so now I share. We were asked to create a Valentines Loaded envelope with two pockets. I loved the way this loaded envelope turned out. It was so much fun to make. This is a 6x9 envelope created using card stock with two pockets. I used the Authentique paper Beloved paper line to create the loaded envelope. I added some lace to one of the pockets along with the love word that I die cut out. I added a jumbo tag with one of the Prima Doll stamps in the second pocket. I colored the Prima doll stamp with copic markers. I then added some handmade rosettes on a stick inside the envelope that have several embellishments. Again, I love the way this envelope turned out, they are definitely addicting to make. I hope you like this envelope, definitely check out you tube and Pinterest for additional inspiration. That's all for today, thanks for stopping by! Have a awesome Friday and we will chat soon. Good Morning crafty peeps, its Thursday and you know what that means. 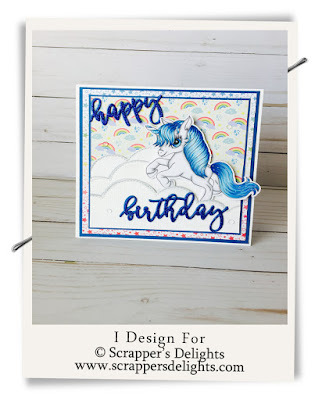 I have a Scrapper's Delight project share for you today. 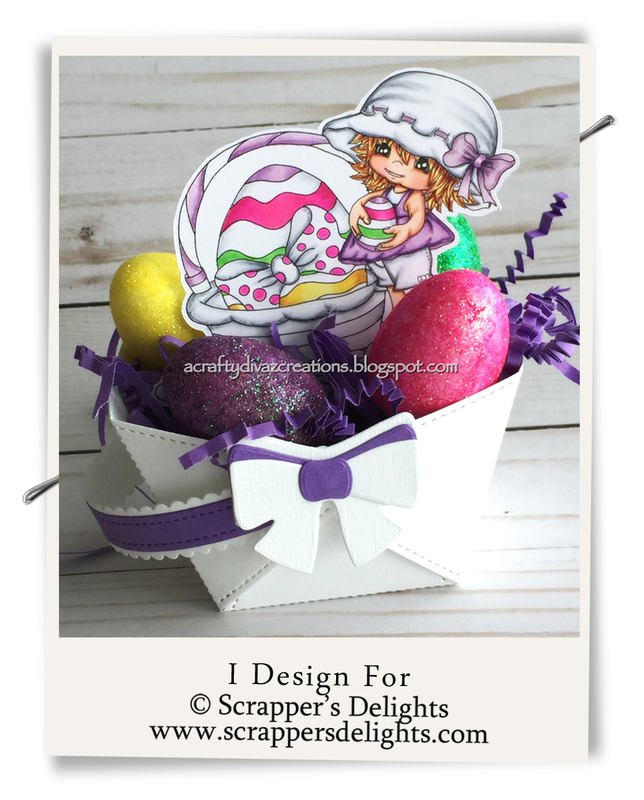 Today I am showcasing this month's progressive freebie, the Easter Basket which is apart of the Easter Category over on the Scrapper's Delight website. You can pick up the easter basket and any of the images in the Easter category for $1.50 this month. Now on to my project, I created a Easter Basket and added the Freebie image along with Easter Babies 1. I colored both of the images using my copics. I wanted to add some pastel and bright colors to this project because that's what reminds me of Spring and Easter. I used a easter basket die from Mama Elephant to create the basket and added the grass to the inside. I then added some eggs to the basket to surround the image. Check out the store for this and other cute Easter images at a great price. 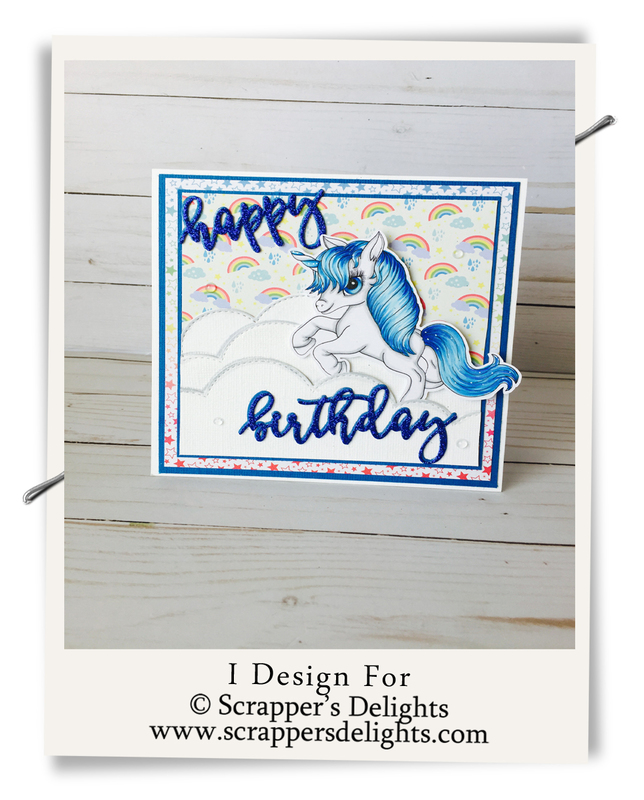 You can also check out Scrappers Delight Inspiration Facebook page and share your Scrapper's Delights projects. Thanks for stopping by, leave a comment and let me know what you think about this cute project. Have a Fabulous Thursday. Good Morning friends, Happy Hump day. We are at the halfway point and heading for the finish line.... THE WEEKEND. Yes, I was screaming, I am excited the weekend is around the corner. I have a project today to share with you using Lucky Linaya by Angelsheartsnmem. I am loving all of her images, they are so cute. Since St. Patrick's day is around the corner, I wanted to create a project to help bring some good luck. I colored the image with my copics and cut her out using my Brother Scan and Cut 2. 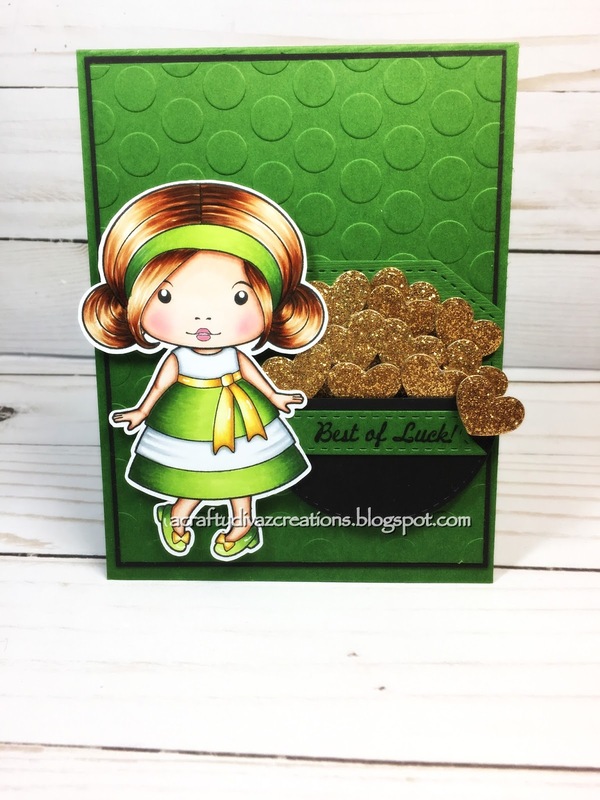 I used a pot of gold treat box cut file I purchased from the silhouette online store. I thought this was perfect to go with this image. I added some green and white twine around the pot of gold along with the shamrock tag. The grass was cut out using the lawn fawn grass border die. I added the sentiment to the front that came with the image. To top it off, I added some hershey gold chocolate nuggets on the inside. I love the way this project turned out and hope you do to. Definitely check out Angela's etsy shop for this image and others. Let her know I sent you over. That's all I have for you today, thanks for stopping by. We will chat soon, have an awesome WEDNESDAY! Good Morning Crafty Peeps, it's time for a new challenge over at Crafty Sentiments Designs blog. This week's challenge is "Anything Goes". 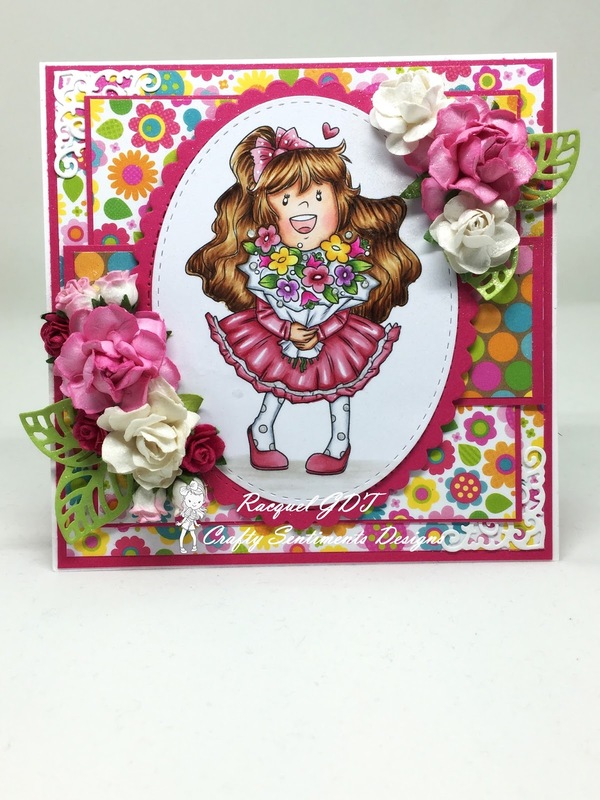 Today's card features Isobel Bunch of Flowers, isn't she adorable? This cutie is screaming SPRING is around the corner. Woohoo, I am so excited!!! I decided to pair this cutie with the spring time doodlebug paper, I love the colors. I colored the image using my copics and cut her out with one of my stitched oval dies. I layered a scalloped oval die cut behind her. I then added some flowers from my stash to the card to add some additional dimension. That's all I have for you today, check out Crafty Sentiments Designs blog and take part in the challenge. Until next time, have a great day! Good Morning crafty peeps, it's Sunday and my day to clean the house. I would rather be in my craft room but sometimes I have do this adulting thing, lol. Today, I am sharing a card using another Angelsheartsnmem digital image Cleaning Claire which you can pick up in her etsy shop here. This is so me for today, cleaning house feeling like there could something better to do today. I created a twisted easel card base and used the lawn fawn perfectly plaid paper with this card. I printed the image on copic x-press it blend card stock. I used my copics to color her up, and used a stitched rectangle die to cut her out. I layered the image on the card front and added a sentiment below for the stopper. I also added midnight blue nuevo drops to the front of the card to create dimension. Check out Angela's etsy shop for this and more cute digital images. Let her know I sent you over. That's all I have for you today, thanks for stopping by. Hopefully you get some crafting in and not stuck doing house chores like me. Have a fabulous Sunday!!! !